Lockport Journal Ron Bachman is on a mission. And that mission has brought him to Niagara County this week starting with Barker on Monday. 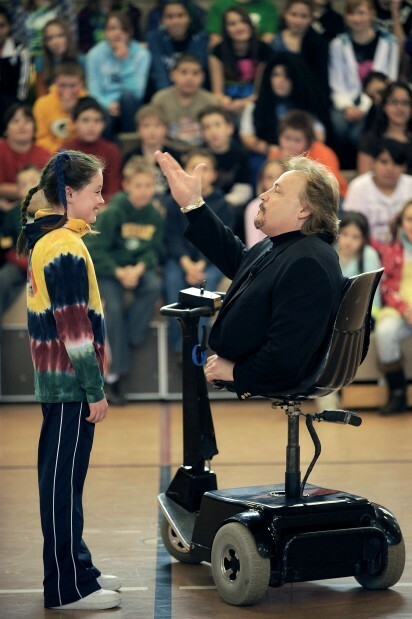 Bachman is a national motivational speaker who visits schools and organizations talking about overcoming adversity, accepting others and bullying in schools. Bachman’s journey around the country has brought him to the area all this week, with his first two stops being Lyndonville and Barker school districts Monday. Bachman said he feels he has some credibility when it comes to talking about overcoming adversity and accepting others. Having his legs amputated as a young child, Bachman moves around with the help of a custom designed scooter. As a result, Bachman has experienced strange looks and cruel remarks (Speaker Ron Bachman brings anti-bullying message to area). Journal Times: Bachman, of Plymouth, Mich., has been speaking since the late 1990s but stepped up his speaking engagements after the school shooting at Columbine High School. "Every couple months we hear about another school shooting," he said. "It always falls on one word: Bullied." To stop bullying and hopefully stop school violence before it happens, Bachman travels the country telling students what can happen when they open their mouths. "You can cause kids to drop out of school, to hurt themselves," he said, telling students Monday that it takes just as much effort to say "I love you" as it does to say "I hate you," and that those words are often shown more through actions. "You don't actually say it but you do it when you push them around and tease them" (Learning that words can hurt).